Just how many acorns does a squirrel need? When you are a sneaky, snacky squirrel, it's quite a few! You can discover just how many that is, in this lift-the-flap board book by Lucia Gaggiotti, called The Sneaky, Snacky Squirrel. Follow squirrel as he tracks down all the acorns he has hidden for later, but cannot remember where. The acorns are different colours, so look for one red acorn, two yellow acorns, and so on. There are fifteen acorns to find in total, in five different colours. By the time the sneaky, snacky squirrel has found them all, he will have lots of food to see him through the winter to come -- as long as he doesn't forget where he put them again! 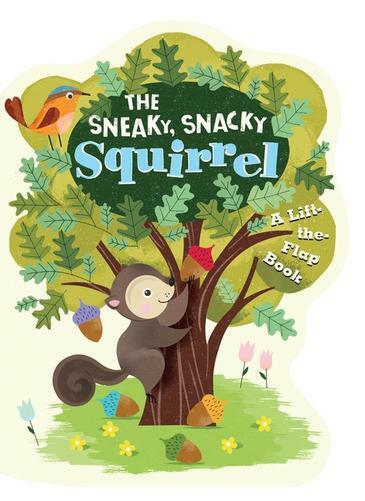 The Sneaky, Snacky Squirrel is a sturdy book in a good size for toddlers, and bright illustrations use the colours of the story to good effect. The flaps are not too obvious, making finding them enough of a challenge, and they are relatively strong, so little fingers can lift them easily. Squirrel-loving readers will be able to explore and count to their hearts content.